What is a great leader… 90% of life is ATTITUDE! 1 What is a great leader… 90% of life is ATTITUDE! Think of one adjective to describe someone you admire or has been your mentor... 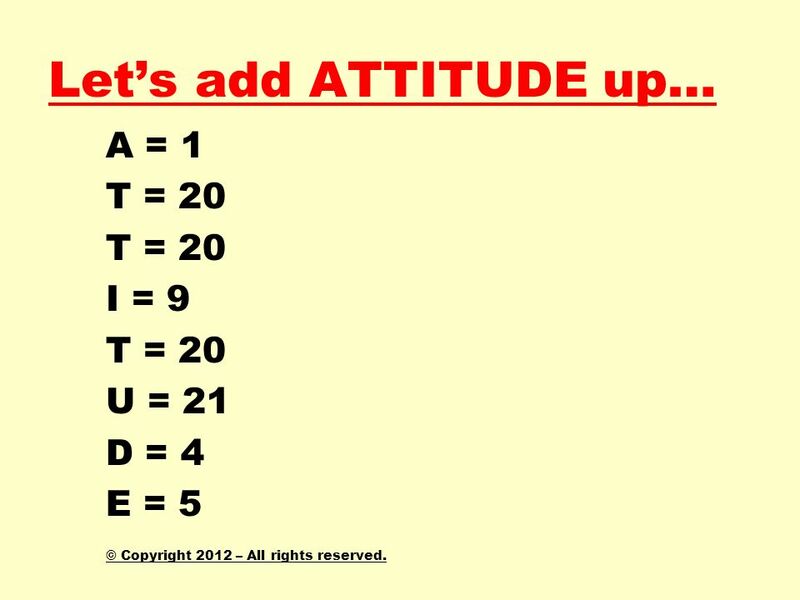 Ask ten people the same… Is it SKILL OR ATTITUDE ? 90% of life is ATTITUDE! Or, maybe it’s more... © Copyright 2012 – All rights reserved. © Copyright 2012 – All rights reserved. 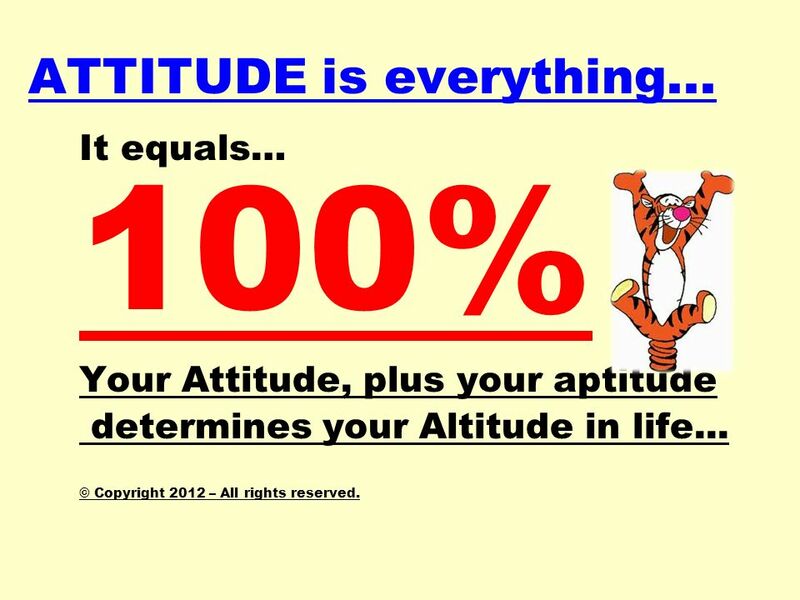 It equals… 100% Your Attitude, plus your aptitude determines your Altitude in life... © Copyright 2012 – All rights reserved. 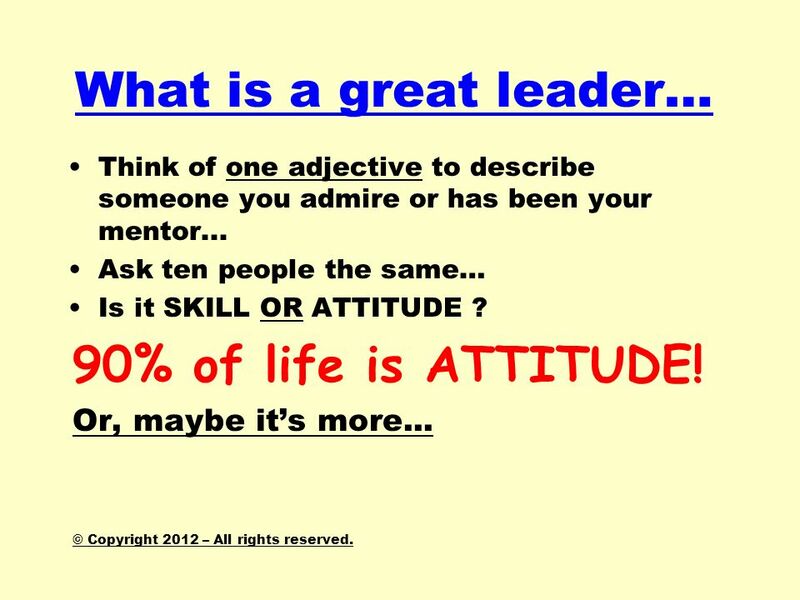 Download ppt "What is a great leader… 90% of life is ATTITUDE!" Copyright © by Holt, Rinehart and Winston. All Rights Reserved. Objectives Use z-scores to find percentiles. Thinking Skill: Explicitly assess information. Copyright ©, Long Beach Unified School District. All rights reserved. - Grade 1 Grade 1 MAP 2 D Trimester 2 Instructional Strategies Regrouping in Addition. ARITHMETIC SEQUENCES These are sequences where the difference between successive terms of a sequence is always the same number. This number is called. Subtraction with Regrouping Mrs. Hicks Look at the ones. Ask: Can we take 3 away from 2? If we cant, then we have to regroup. 10-1 Tables and Functions Learn to use data in a table to write an equation for a function and to use the equation to find a missing value. Solve inequalities by using the Addition or Subtraction Properties of Inequality. Main Idea/Vocabulary.